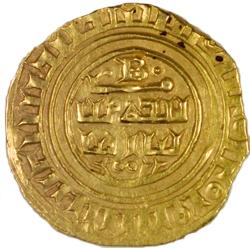 Tripoli, Bohemond VI or VII, gold bezant, 1251-87. Courtesy of Princeton University Numismatic Collection. On Tuesday, July 10th at 7:30 pm, Dr. Alan Stahl (Princeton University) will be presenting the annual Medieval Academy of America Lecture at Leeds and speaking on “The Mediterranean Melting Pot: Crosscurrents in Medieval Coinage.” Dr. Stahl is the curator of Numismatics at Princeton University. A reception, hosted by the MAA, will follow immediately. We hope that if you are at Leeds you will join us for the lecture in the Lawnswood room and reception (Weetwood: Breakout Area). Preview: In the half millennium from 1000 to 1500, Europe went from being a marginal participant in the eastern Mediterranean to playing an active and even dominant role in its economic and political life. Nowhere is this growing hegemony more concretely exemplified than in the numismatic realm. From reliance on the small, and often base, silver penny of the central Middle Ages — all but useless for long-scale commerce or major capitalization of military expeditions — European mints gradually added denominations of large silver and gold coins based on Byzantine and Islamic models. As European dominance in the monetary sphere grew, its new coinages became the basis of Mediterranean trade and were adopted by Latin colonial minters and, in turn, became the basis for issues by autochthonous Eastern rulers.